As connoisseurs of music, Leslie and I are surrounded by a world of song. Naturally, there are specific songs that remain very special to us. 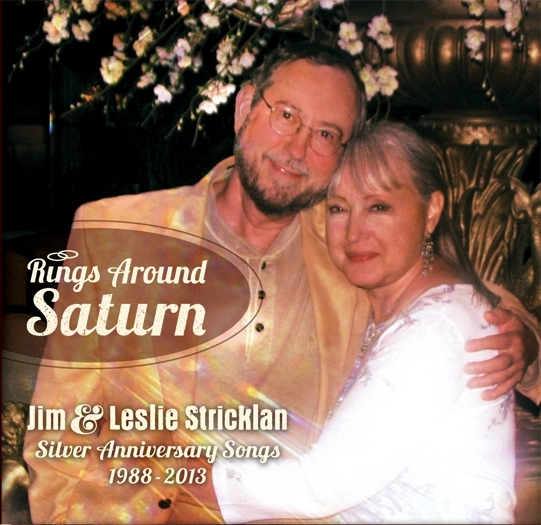 Rings around Saturn,which was inspired by the fantastic photos from Voyager, was the first song I played for her when we began dating in 1985. Two years later, I composed Dance the Milky Way as a marriage proposal. 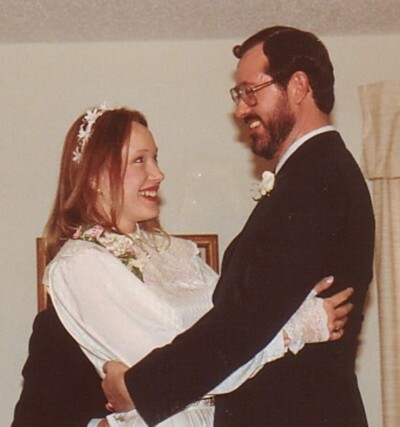 Happily, she agreed and we were married on January 16, 1988 at my parents’ country home near Teague, Texas. 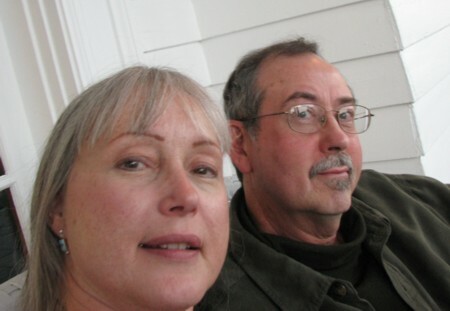 Over the past twenty-five years, I’ve written other songs for Leslie and we have written many songs together…The Whisker Song, Tale of Two, Mr. Dad, Ode to Eight Belles, and Do Some Good, to name a few. All have a special meaning to us; reminders of particular places and times in our life together. 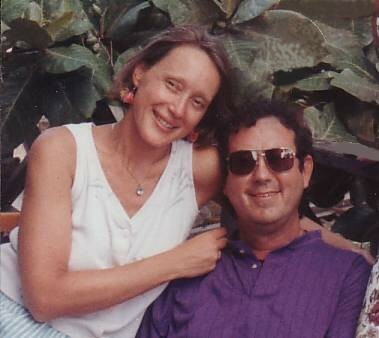 Following a memorable trip to Belize, …Coconut Tree was recorded on our 5th anniversary. Snows of Kilimanjaro was written to celebrate our 20th. Usually we prefer to let the songs tell their own stories, though a few special memories are included below. On this lovely occasion, we want to share our musical gift of love with you—who have been and still are—an important part of our lives. We hope you’ll enjoy our 25th Anniversary collection! 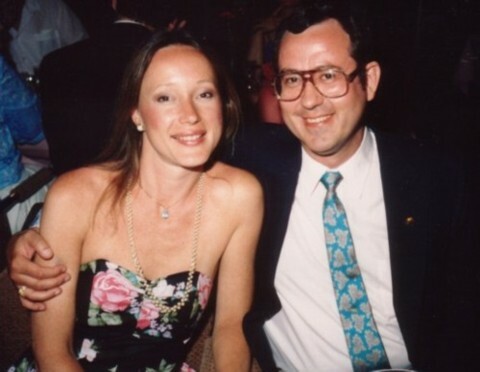 Central to this story is the fact that I met my wife, Leslie Capek Stricklan, while dining at the legendary Buckhorn Exchange in Denver around 1985. The Buckhorn is a historic museum, steak house, and saloon. 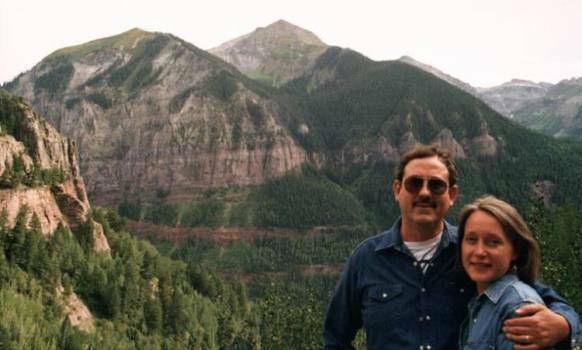 After we’d been dating awhile, Leslie took me to stay at an old log cabin very near the Royal Gorge, to go horseback riding. The main cabin and its smaller companion were both constructed by pioneer Vic Miller. Miller’s tragic story is told—in his own words—in a book inside the cabin. Leslie’s former boss August Perez (retired president of Perez Architects, a New Orleans firm with a Denver office at the time), who is quite a colorful character himself, owns the cabin. Leslie and I spent a magical snowy night in Augie’s Cabin. I wrote the song following our visit. At my request, a band called Quicksilver recorded it, as a surprise gift for Augie. I lost my copy of their recording long ago. 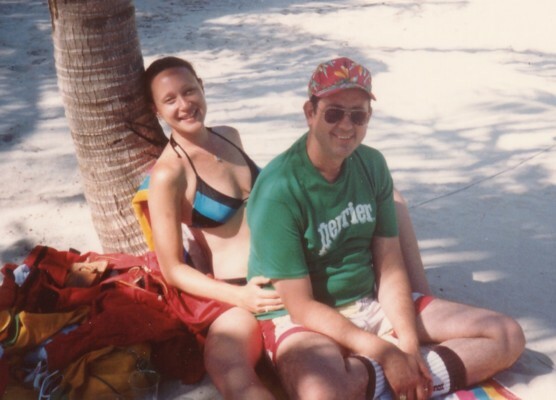 Finally, the song has come back around, in tribute to Vic Miller…and to Augie. 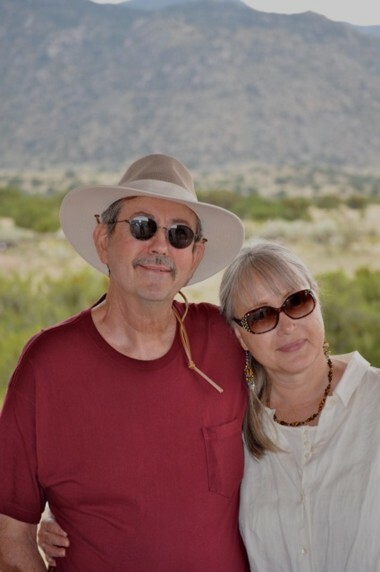 Since moving back to my native Texas, where we’ve settled in South Austin, we’ve made several pleasurable visits to New Mexico and Colorado to visit friends and family. On one trip we vacationed in Santa Fe before heading on to Castle Rock and Denver. We enjoyed a leisurely drive from Taos, down through the Cimarron Valley where a buffalo herd was grazing. A day or two later I woke up and drank coffee under the awesome view of Mt. Evans and Pike’s Peak—both visible from my friend Scott Maiers’ mountain home. Buffalo Along the Cimarron came pouring out of me. Mighty good coffee! Who can forget the heart-breaking end of the Kentucky Derby in May 2008? Eight Belles was the single courageous filly who, tragically, broke her legs and was put down at the end of the race after nearly winning. Leslie woke the next morning, with intense emotions and a chorus in her head. We worked straight on through the morning to finish writing the "Ode to Eight Belles" tribute song, which weaves together the pieces of Eight Belles real story which Leslie researched as we composed, such as references to her sire, "Unbridled Song" and her prior stakes race wins at "Fantasy" and "Honey Bee". "Mr. Dad" is a tribute song for Leslie's father, who was, and still is, a great inspiration to her and her siblings. Her lyrics refer to many particular family events, yet the universal message of honoring brave fatherhood rings through. 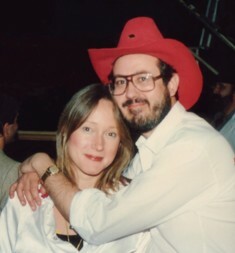 All songs were written by Jim Stricklan or Jim & Leslie Stricklan as noted. Copyright Front Room Music. Jim and Leslie, Larry Rothwell, Ted Arbogast, Scott Beckwtih, Doug Taylor, Gary Feist, Gregg Lowery, George Coyne, Richard Bowden, Frank Kammerdiener, Joey Colarusso, Cara Cooke, JP Allin, Alan Wing, Scott Wade, Joseph & Theresa Brunelle, and the "Sari Women Chorus" (listed below for "Coconut Tree"). Jim — vocals and Martin D-35 and 12-string acoustic guitars; Scott Beckwith — bass. Recorded at Music Lane, Austin TX with Bill Munyon, engineer and Ted Arbogast, producer. Jim — vocals; Jim — Washburn EA26 acoustic/electric guitar; Doug Taylor — bass & mandolin; Doug Taylor & Larry Rothwell - harmony vocals. Recorded at Flashpoint Studio, Austin, TX with Eastside Flash, engineer. Jim — vocals and Martin D-28 000 acoustic guitar; Leslie - backing vocals. Recorded in south Austin, TX with Mark Viator, engineer. Jim — duet vocals and Washburn EA26 acoustic/electric guitar; Leslie - duet vocals; Doug Taylor — bass; Joey Colarusso — flute. 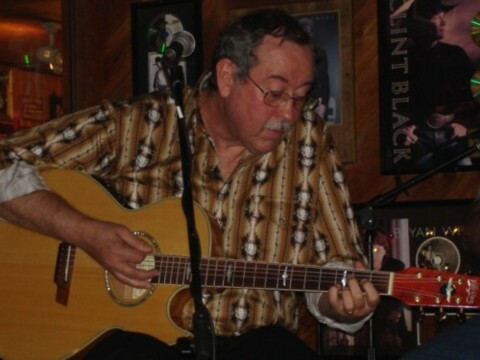 Jim — vocals, harmonica, and acoustic and electric guitars. Recorded at Front Room Music Studio, Austin, TX by Jim Stricklan. Jim — lead vocal & Alvarez AD90 acoustic guitar; Doug Taylor — bass; Gregg Lowry — clawhammer banjo; George Coyne — dobro; Cara Cooke-harmonica. 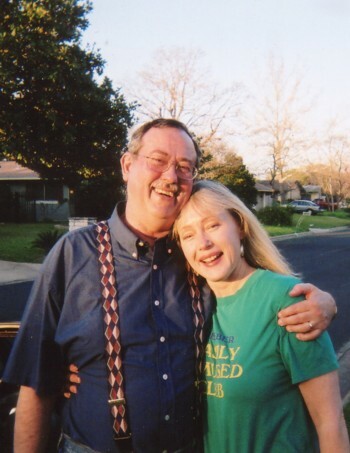 Recorded at Parrot Tracks Studio, Manchaca, TX with George Coyne, engineer. Jim — lead vocal, harmonica & Alvarez AD90 acoustic guitar; Leslie — backing vocal. 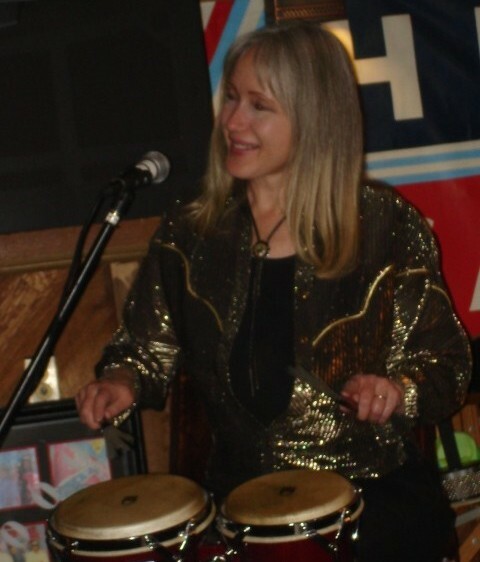 Jim — lead vocal & acoustic guitar; Larry Rothwell - acoustic guitar; Ted Arbogast - lead electric guitar; Gary Feist - bass; Alan Wing - congos; "Sari Women Chorus" backing vocals - Leslie, Lin Sutherland, Paula Smuck, Haley Moberg, Anne Ford Boettner, Tree Brunelle, Mary Torczon, Barbara McCandless. Recorded at Music Lane, Austin TX with Wayne Cathright, engineer and Ted Arbogast, producer. Jim — vocals & acoustic guitar; JP Allin – harmonica. Recorded at Lonestar, Austin, TX by Jim Watts engineer and producer. Recorded in South Austin, with Mark Viator, engineer. Jim — vocals and acoustic guitar; Frank Kammerdiener – cellos, bass viola, strings. Recorded at FK Studio, Austin, TX by Frank Kammerdiener engineer and producer. Jim — vocals and Martin D-28 000 acoustic guitar; Doug Taylor - bass; Richard Bowden - fiddle. Jim — vocals and Martin D-35 acoustic guitar; Ted Arbogast - lead electric guitar and bass; Scott Wade - congas and percussion; Joseph & Theresa Brunelle - backing vocals. Recorded at Music Lane, Austin, TX with Bill Munyon, engineer and Ted Arbogast, producer. Recorded at Red Rivers Studio, Bossier City, LA with Charles Smith, engineer. Compilation audio mastering: by George Coyne, Parrot Tracks Studio, Manchaca, TX. Design concept by Leslie Stricklan, who is an architect. Design and final production by Michelle Rahbar, Mothership Arts, Austin, Texas. Cover photo by Steve Darnall - Jim and Leslie Stricklan at Palm Court, Drake Hotel, Chicago IL, 2010. 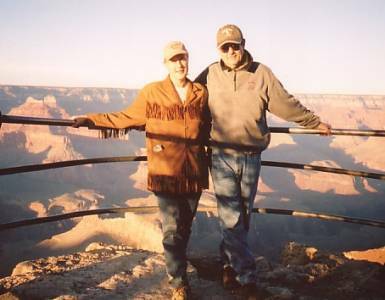 Inside photo by Rick Stricklan - Jim and Leslie Stricklan at park in Albuquerque NM, 2009.
you surround me with your love. further than we’ve ever gone before? can I always count on you my friend? will you come along and share this love of mine? music and laughter from a lonely man? spreading lots of joy along the way? Why do whiskers like to grow on funny faces? Why do kitty cats like to sleep in guitar cases? Why do old socks slip down in your shoe? Why do I like being here with you? Why do lemons like to squirt you in the eye? is it elementary when Sherlock finds a clue? Why do basketball players grow so tall? Why does winter always follow fall? Why is that old hoot owl always asking WHO? 'Cuz we’re up in Augie’s cabin in the hills. yea we’re up in Augie’s cabin in the hills. In your cowboy boots and jeans. maybe the best is yet to come. how lovely loving you can be. you are the architect of my dreams! you know you’ll never be alone. spicy Sichuan beef for you. "Distance lends enchantment to the view". we’ve both been down that road before. and distance lends enchantment to the view. to catch a dream, for Mister Dad. never to part, from Mister Dad. reaching out with love that carries on…. did he guess this was the first of four they’d have? and now he was a family man! along life’s way, for Mister Dad. climbing the ladder in the fortune game. they were not lost, on Mister Dad. I was still wild and fancy free. I was a lost and lonely man. Heaven’s really not so hard to find. love makes it easy to believe. beside the Big Brown bay. she was reaching for her dream. as they put Eight Belles down. and ran her longest mile. if you never take the time to care? make a world of difference that you came. Do do do do do do some good today. Do do do do do do some good in your own way. before we face the great unknown. Where love’s concerned, you’re never far away. Even when I lose direction, I hope that it won’t show…. about the eight greatest treasures that man has ever seen. I hope to find number nine…my lost treasure tonight. never to trade love again for fortune or fame.